HVS - A Structured Approach to Native Mitral Valve Infective Endocarditis: Is Repair Better than Replacement? A Structured Approach to Native Mitral Valve Infective Endocarditis: Is Repair Better than Replacement? Rufin J. Defauw, MD, Anton Tomšič, MD, Thomas J. van Brakel, MD PhD, Nina Ajmone Marsan, MD PhD, Robert J.M. Klautz, MD PhD, Meindert Palmen, MD PhD. Leiden University Medical Center, Leiden, Netherlands. OBJECTIVE: Mitral valve (MV) repair in native active infective endocarditis (IE) is technically challenging. The survival benefit over valve replacement is poorly established and could be absent because of the high risk of repair failure and reoperation. We explored the results of our structured treatment approach to these patients. METHODS: Between 1/2000 and 1/2017, 149 patients underwent surgery for native mitral IE. 97 (66%) patients underwent valve repair whilst 52 (34%) underwent replacement. Our structured approach consisted of early surgery, blood stream sterilization prior to surgery, and radical resection of infected tissue. A critical assessment of expected repair durability was made intraoperatively and repair was not performed if concerns regarding long-term durability existed. 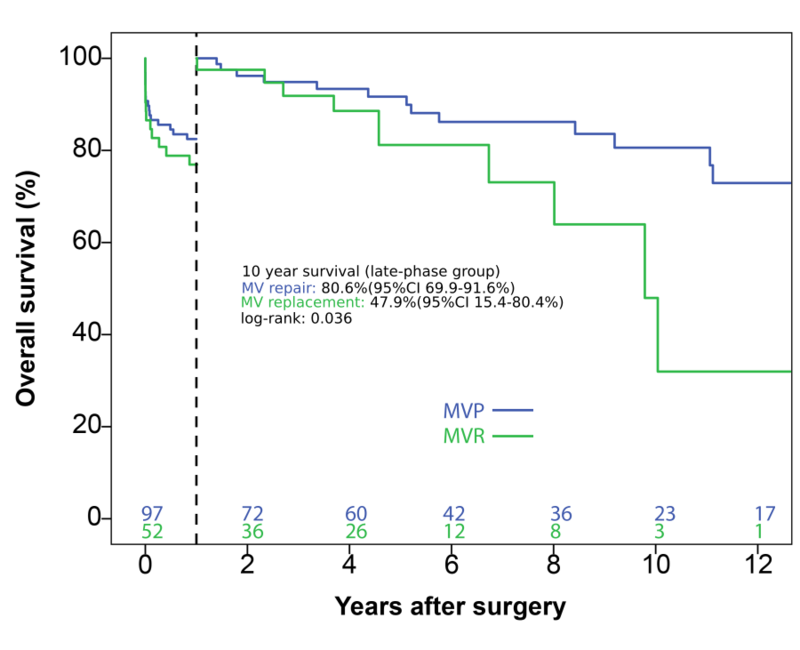 To study the effects of valve repair on overall survival, a landmark analysis was performed. RESULTS:In-hospital mortality was 16.1% (14 repair patients vs. 10 replacement patients; P=0.381). There were no cases of residual IE or early reoperations. On Cox proportional-hazards analysis, valve replacement was not inferior to repair within 1 year post-surgery (HR 1.1; 95%CI 0.49-2.46; P=0.824). Beyond 1 year post-surgery, replacement was associated with decreased survival (HR 2.62; 95%CI 1.07-6.44; P=0.036). Recurrent infective endocarditis occurred in 5 repair and 1 replacement patient (P=0.667) and MV re-intervention occurred in 8 and 5 patients respectively (P=0.765). CONCLUSIONS: Active MV endocarditis remains a complex disease with significant early and late morbidity and mortality. A structured approach allows two-thirds of patients to undergo valve repair. Clinical results could be improved by focussing on early surgery, prior to extensive valve destruction, to enable durable repairs and help improve late outcomes.